What Is Patchwork and Is it Only Used in Quilts? When quilters define the word patchwork, they are referring to a piece of fabric that is created when smaller pieces of fabric, often called patches, are sewn together. We can make patchwork by joining the same or identically shaped pieces of fabric into a larger piece of fabric. We often create patchwork by sewing fabrics into smaller sections and then joining the sections. In quilting, the smaller sections made by quilters are usually individual quilt blocks. Is Patchwork Known by Other Names? Patchwork is sometimes called piecework. The act of making patchwork is called piecing. Patchwork is best known for its use in quilting patterns but can be found in garments, handbags, and many other projects. How Is Patchwork Sewn Together? 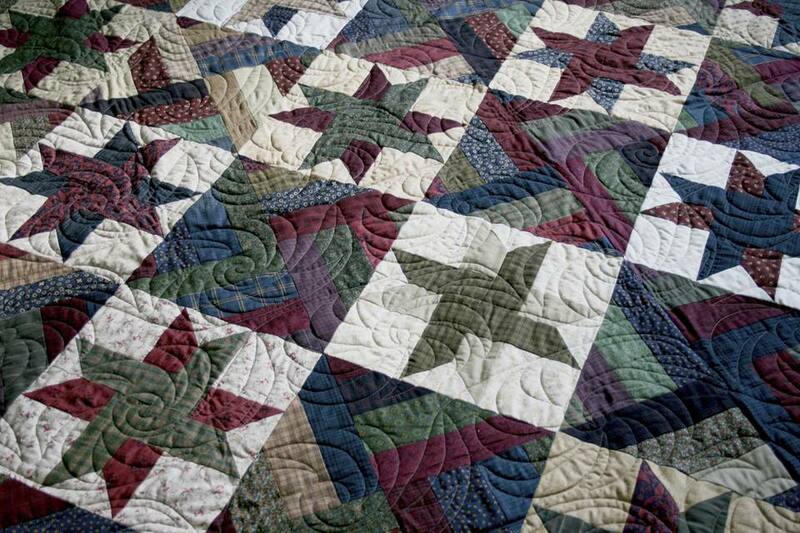 Patchwork was sewn by hand before sewing machines were invented. Today, most quilters and other craftspeople use sewing machines to create the patchwork, although many crafters still enjoy the process of hand piecing. One patch quilts, which repeat the same shape over and over. Four patch quilt blocks, which are made up of four pieces of fabric, two across and two down. Some shapes in a four patch are often divided into multiple segments. Five patch quilt blocks are a bit different. They are structured with 25 patches, five across and five down. Individual patches can also be divided. Seven patch quilt blocks contain seven patches across and down. Each patch can change shape, but unless you're making a very large block it's uncommon to see seven patch blocks divided into more than one shape each, such as half square triangle units. Nine patch quilt blocks initially contain nine square patches, but the majority of nine patch sections are subdivided into a variety of shapes. Foundation pieced and string pieced quilts are made differently than other types of projects, but both techniques are considered patchwork quilts. You'll discover other types of patchwork as you explore quilting techniques. Sewers have used patchwork for centuries, sometimes to create works of art but overall in a more utilitarian way to keep families warm on cold nights. The economic status of families no doubt dictated how quilts were made. Look at vintage quilts and you'll find huge differences in their appearance. Cloth feed sacks became an important source of fabric during the Great Depression in the United States. Many manufacturers already packaged their goods in cloth bags, including animal feed, flour, sugar, and other items. Fabric on the bolt was scarce (and expensive) during the Depression so seamstresses used the empty bags to make clothing, quilts, and other items that required cloth. Manufacturers began printing the bags in a huge variety of colorful prints, making the empty sacks even more useful for home needs. Like all other forms of crafting, patchwork quilting has its ups and downs in popularity. The current surge of quilting began in the 1970's. It was about that time that new magazines began to be published and new tools were introduced to make quilting easier. Will the craft fall our of favor again? Perhaps, but quilters are passing the craft on to their daughters (and sons). So I expect we'll begin to see even more changes and creativity in quilts as the years go by.